Bail Money - I Got My Money Back!!! This weekend, I was looking forward to doing a whole lot of nothing and pretty much just hanging around the house and catching up on my sleep. Unfortunately, Saturday morning around 6am, my sleep was cut short by a phone call. The call came from an unknown number and I don't usually answer those calls. They called three times before finally leaving a message. Since they kept calling, I figured it may be important and promptly checked my voicemail. It was a message from my cousin's girlfriend asking me to call her back ASAP and it was urgent. They have a one year old child and I figured that maybe something bad had happened and she needed me. I quickly called her back; only to find that my cousin had been arrested the night before and they needed $1300 to bail him out of jail. My first thought was to say no. Over the years, I've adopted a pretty strict policy against loaning money to family and friends. I've done it in the past and it usually ended badly. This time though, after thinking about it for a little bit, I figured I needed to help him out. He just started a new job and I knew he had to work on Saturday afternoon. Having a young child, he can not afford to lose his job. Reluctantly, I rolled out of my nice comfy bed, got dressed and headed to the bank to withdraw $1300 from my Slush Fund and then head over to the county jail. I am so thankful that I have a Slush Fund for things like this. This savings account is my first line of defense before hitting my real Emergency Fund. This account covers those minor emergencies, irregular expenses and things I just plain forgot about. I can withdraw money from this account and it does not disrupt my finances very much since I set aside a fixed amount each month out of my regular budget. Finally, after waiting around for several hours, they released him. We got out of there around 3pm; just in time for him to get a shower and get to work and just in time for me to get back home and take a nice 2 hr nap. When my uncle died about 10 years ago, he left my cousin a small amount of money in a savings account. I didn't realize he still had it until he came over yesterday to bring me back the $1300. I really didn't expect to get the money back; at least not all at once. Luckily, the thing he got arrested for was a misdemeanor and will probably get his money back once he goes to court in November. 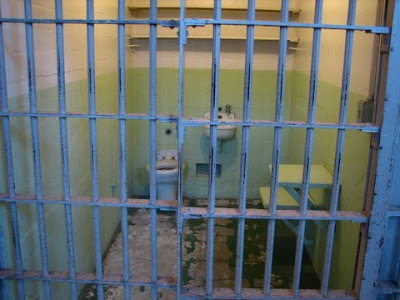 Hopefully, this will be a learning experience for him and his first and last experience with the inside of a jail cell. Yeah, I did the bail thing for a friend one time. Lucky for me, it was only $50, not $1300! And he promptly paid me back! I don't see bail money the same as a oan to family anyway. Bail is money used to insure that the defendant in a court case makes his appearance in court and/or does not flee prosecution. I would less of a problem giving a family member bail money than giving them a loan. I would just insist I be informed of all court dates so I could make sure he is there. I'd be interested to hear more about the orange account. Have you posted on this before? I'm a new reader. Good thing your cousin promptly paid you back. Even better that you broke your "strict policy" and decided to loan your cousin. Nice blog! It's nice to help others out when you have the money to. It's even nicer when your kindness is repaid, literally or figuratively.